Salt is bad for most things; it breaks apart glass and ceramics, corrodes copper alloys, and contributes to the decay of organic materials. It is especially bad for iron artifacts and, after 300 years in the ocean, the iron from Queen Anne’s Revenge is very, very salty. Anyone who has lived near the ocean or in a cold climate where roads are heavily salted has probably seen the power wet salt holds over iron. Rust holes in a car, rebar cracking out of a bridge support, rusty hinges… if you live near salt, you know this pain. In the ocean, it’s turned up to eleven. Salt – specifically sodium chloride – destroys iron in two ways, physically and chemically. Chemically, the chloride ion in salt acts as a catalyst; it causes iron to oxidize (or rust) much faster than normal. In the ocean, dissolved salt moves freely into different rust layers and into the iron metal itself along structural weaknesses. If an artifact dries after being in the ocean, dissolved salts can recrystallize and physically break sections off the iron. This gives better oxygen and moisture access to the chloride in the iron, which catalyzes corrosion, which breaks off, which gives better access to oxygen and moisture… and anywhere from days to months later, you come back to a vaguely artifact-shaped pile of rusty chunks and orange dust. So how do conservators stop this happening, and allow iron objects to be displayed in a museum? Simple: we remove the salt. The most common method we use to remove salt is called electrolytic reduction. We place the object in a highly alkaline, conductive solution (usually 1-2% sodium hydroxide, or lye, in purified water) with two steel plates which do not touch the object. A low-amperage DC electrical current is connected, with negative current applied to the iron artifact and positive current to the steel plates. The damaging, negatively-charged chloride ion in salt (Cl-) is repelled by the negative electrical current in the artifact, and attracted out into solution towards the positive charge on the steel plates. These plate anodes are sacrificed, rusting heavily. 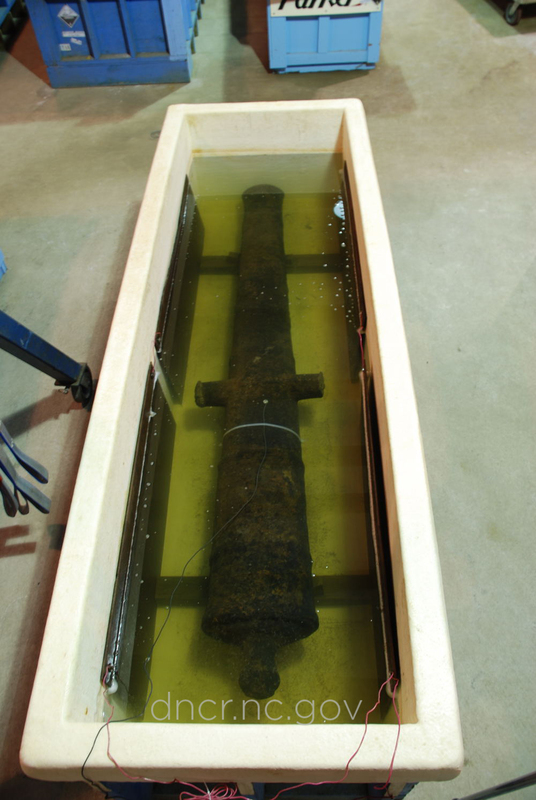 The artifact – be it a cannon or a nail – loses chloride and oxygen and begins to stabilize. Every month, the chloride content in the surrounding water is tested with an Ion Selective Electrode, and we watch the salt level in the water climb. If it stops climbing? Change the water and start over, continuing until the chloride level is stable as close to zero as possible. The length of time this takes depends on the size of the object and how often it is possible to change the solution. A single nail might be done in a few months. Cannon balls usually take 12-18 months. Cannon – especially larger ones – can take upwards of 7 years to fully remove salt. Once all the salt is removed from an artifact, it will be stable enough to dry and begin preparing for museum display. 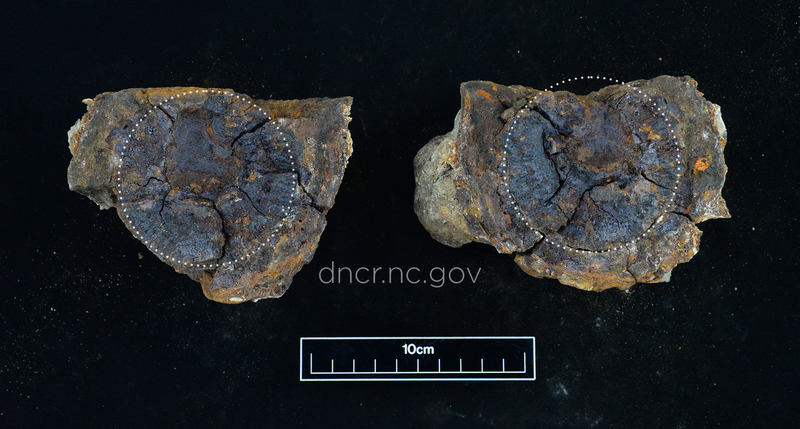 -Broken cannonball in concretion, image by NC Department of Natural and Cultural Resources. -Cannon C24 in elecrolytic reduction, image by NC Department of Natural and Cultural Resources.